At the end of Kossuth Street, the second of our three houses is the Middle House with its funky, 1960s design. It is the only house with a well in its original place on the terrace and has the prettiest view on the garden. Behind the gate in front of the house as well as behind it you will find ample parking space. You enter through the entrance hall with its pleather mini-couch, then you proceed to the large living room with its big fireplace, its glass wall facing the terrace and its generously dimensioned open kitchen, all designed in different shades of blue. The period furniture has all been locally purchased and renovated, while the kitchen has everything you need to make a simple - or very elaborated meal. On the kitchen walls, you can admire 1960s ladies’ magazines from Hungary, while the walls are decorated with copies of socialist-realist art works. 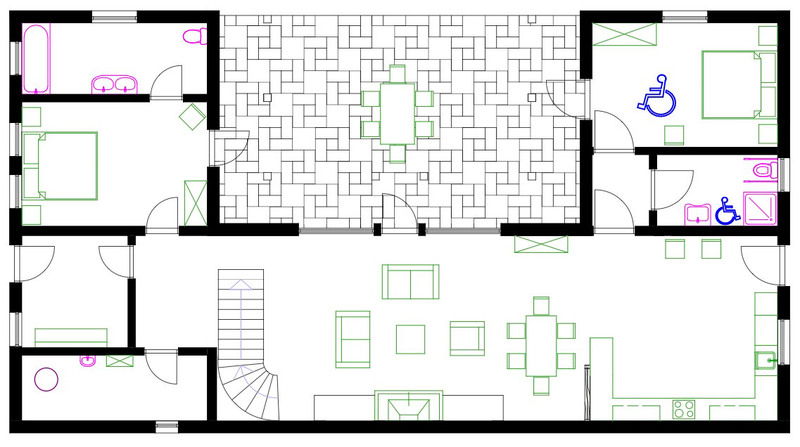 From the living, you get to both downstairs bedrooms, each with their own bathroom. One bathroom is equipped with a bath tub, while the wheelchair-accessible bathroom has a shower. 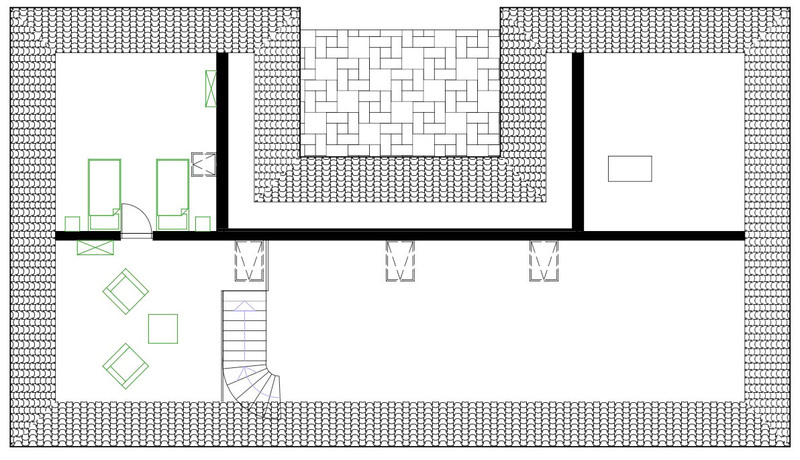 From both bedrooms you have direct access to the terrace, which in turn leads to the stairs to the lawn. From the living room, the wooden stairs lead to the cosy reading corner and the spare bedroom. All three bedrooms have two beds, which can be used as single beds or converted into double beds, according to your own wishes. In the utility room you will find a washing machine, a vacuum cleaner and other utensils for daily housekeeping purposes. The terrace has a comfortable outside table with 6 chairs. From the garden, a shared boardwalk will get you to the swimming pool. Downstairs in the lawn, you have private outdoor cooking facilities at your disposal: a grill and a stove for the quintessential Hungarian experience: the ‘bogrács’ (kettle) used to make your own goulash.